Chrissie is surprised about Paul's engagement and thinks it's too soon, especially since he isn't divorced from Gail yet! Paul says that it's nearly sorted and they must start making arrangements soon. Isabella moans about her family being absent so Paul agrees to fly them all over for the wedding! Doug has finished breakfast and leaves for work. PAM (doing a crossword): What's a nine letter word for love? He leaves and Melissa arrives and spots bacon on Cody's plate but Doug gave it to her. Cody hasn't told Pam and Doug about being vegetarian yet, she's worried how they will react but Melissa tells her she must tell him soon. 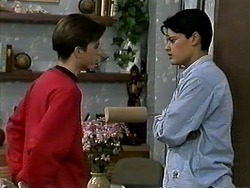 The subject turns to Todd and Josh, Melissa thinks Josh is avoiding her and he is going to dump her. Todd is telling Josh he must tell Melissa about Katrina (the other girl). He decides to dump Melissa but he doesn't know how to. TODD: It breaks up our little group. JOSH: That's the way it's gotta be. Jim is helping Helen set up for the day but Helen would rather he left her alone but Jim is insistent as he's worried he might have taken too much on. Paul and Isabella arrive to announce their engagement; Jim and Helen are also surprised. Todd arrives and Cody questions him as to why Josh is avoiding Melissa. CODY: You can't keep a secret round here. TODD: You said you knew. Todd asks Cody to ignore it but she doesn't want to, she's going to tell Melissa. 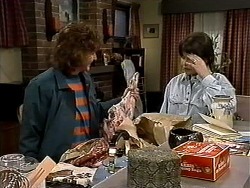 Later on, Pam returns with a whole side of lamb, Cody looks a bit pale as Pam decides she has to help her chop the meat up! Pam gores outside as Melissa returns, she isn't keen on the meat but Cody changes the subject to Josh. CODY: The nerd is two timing you. MELISSA: He wouldn't do that. Melissa eventually believes her and decides Josh must pay. Josh is playing a computer game as Todd decides they should go and tell Melissa about Katrina. Josh insists that he can't and makes Todd go to The Coffee Shop instead. Chrissie is interrogating Helen about Isabella, Helen is worried that it's too quick but she likes Isabella. Chrissie says she doesn't trust her, she has a “bad feeling” about her. Steak and kidney pie is on the menu, Cody won't eat it though. CODY: Melissa is a vegetarian now. DOUG: She'll end up pale and skinny then. CODY: Not all vegetarians end up like that. DOUG: Yes they do! And I'll tell you why, they don't get enough protein, now eat your dinner. Pam takes Cody's dinner away and says she can't have any more food until the evening; Cody sneaks some bread into her pocket. Chrissie answers the phone, it's the Department of Immigration for Isabella, and her family have made an application for emigration to Australia. Isabella returns and Chrissie tells her about the message but leaves out the family part. As Isabella phones back Chrissie hangs around to listen in so Isabella just makes an appointment at the Department's office. Later on Chrissie asks Isabella about the Immigration Department, Isabella says she has some forms to sign for the wedding. Chrissie then explains that they mentioned her family emigrating over to Australia; Isabella just says that the Immigration Department was confused by her accent. Chrissie doesn't believe her though. PAUL: How's it going Gran? HELEN: If people keep asking me that I'll turn nasty! Paul protests by saying that Helen has taken on too much. HELEN: Paul, unless you want to end up wearing this cheese cake I'd get out of my way! Over at a table Melissa confronts Josh about Katrina, he admits it but then runs off for a “music lesson” leaving Melissa upset. Todd tries to defend Josh but Melissa is angry, as she sits down she finds Josh's violin and decides to follow him. Pam has found some sausages that Cody hid, Doug laughs it off but Pam thinks their might be more of a serious problem with Cody's eating. Melissa is following Josh, she hides behind some bushes as Josh walks up a drive and into a house.